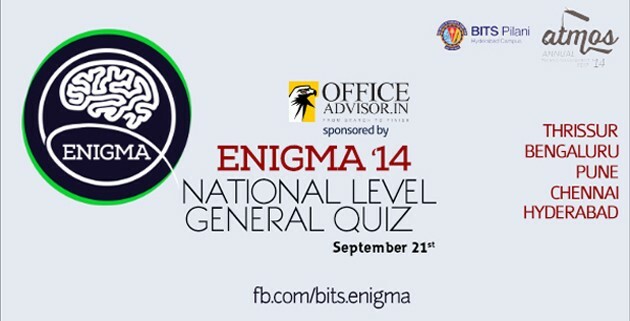 Enigma is the annual multi-city general quiz conducted by the students of BITS-Pilani, Hyderabad Campus. The quiz is conducted as a part of our techno-management festival, ATMOS. The quiz will span across two phases. Regional rounds will be held in five different cities and the top two teams from each round will progress to the national final which will be held during ATMOS, scheduled to take place from 9th to 12th October. This year, regional rounds in Bangalore, Pune,Chennai and Thrissur will be held on September 21st and the Hyderabad regional round will be held on October 11th just before the national finals. A school round is conducted in Hyderabad alone which sees a brisk turnout of students from more than 50 schools. All the quizzes are meant for teams of two. Cross-institutional teams are allowed to participate. This year, the Hyderabad round and the national finals will be conducted by Navin Rajaram of Nexus Consulting which is known for conducting quizzes across the country.